You know how to conjure magical forces from dust and use them to permanently enhance weapons and armor. Or maybe, you’re the one who takes all the beautiful gems and stones and combines them with runic forces to create powerful jewelry and trinkets. Or you could be the one who uses the power of the written word to do your bidding -writing spells and enchants with magical inks the allows others to taste only a part of your sorcery energies. Whatever your arcane ability is – or if you just want to get in touch with your inner mystic – hopefully, these outfits are for you. 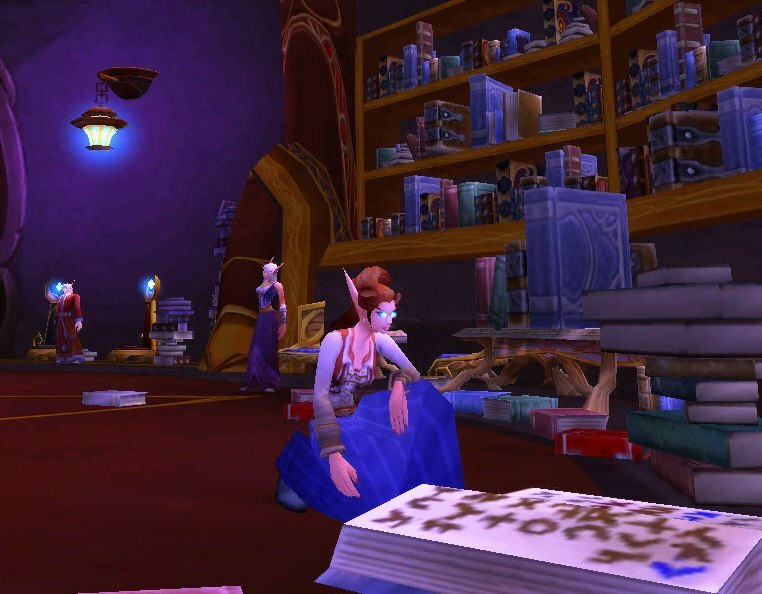 Like the crafting outfits, enchanting, jewel-crafting, and inscription have limited off-hand frills and/or gadgets to make whatever outfit your character is wearing obviously related to that profession. Some of these outfits may look to be ordinary wizard outfits, or just fancy everyday wear; but, as with the crafting outfits, posing next to profession objects around town does make them different for professional wear ^_^ . Enchanting outfits are probably the easiest of this type of professional wear to put together. 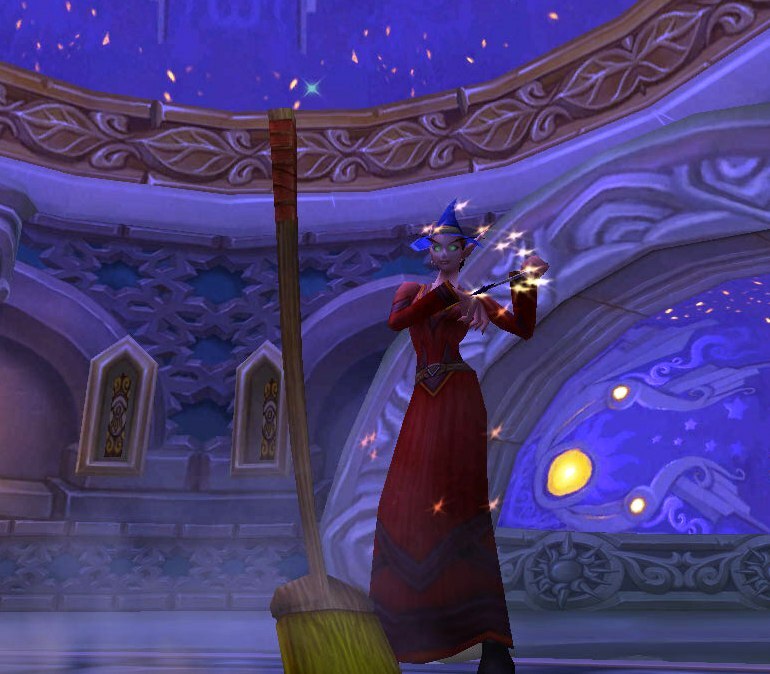 There are a wide variety of wands and off-hand frills that are definitely “enchanting”. While more inscription NPCs appear to have pointy helms, they are not uncommon for enchanting outfits, and, are probably one of the best helms for these outfits. This first enchanting has some Disney inspiration to it. 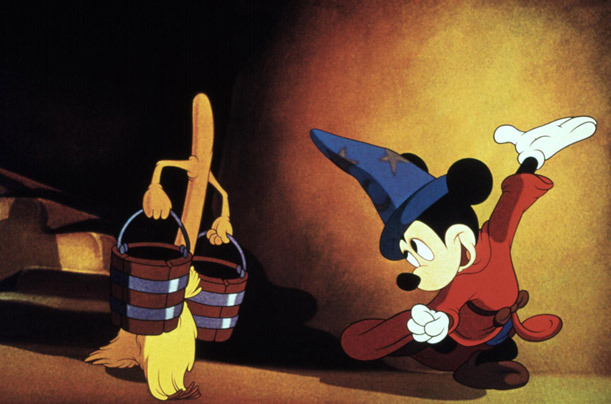 LoL, this is my attempt to look like Mickey Mouse in the original Fantasia movie. While the Elementalist Star and the Knitted Belt have plenty of other identical options, the Red Linen Robe is the only (mostly) all red, and easily obtainable robe to match the “inspiration” (that I could find). 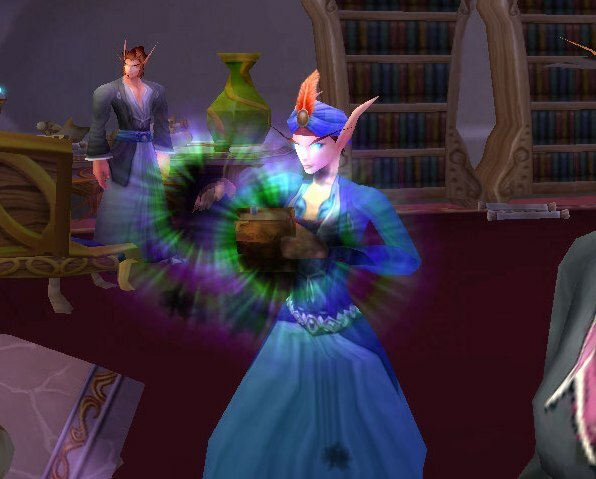 While this hat would be perfect for this outfit, and any other mystic outfit created (*ahem* Blizzard, you reading this? 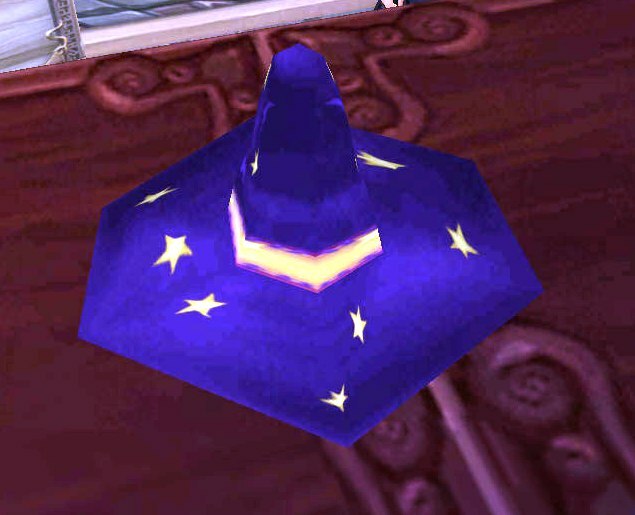 ), the Sorcerer Hat can be replaced for other blue point hat options such as the Mistscape Wizard Hat or the Silk Wizard Hat. This outfit is similar to what some of the Darkmoon Fortune Tellers wear (the Troll fortune tellers wear a robe Big Voodoo Robe, just fyi). 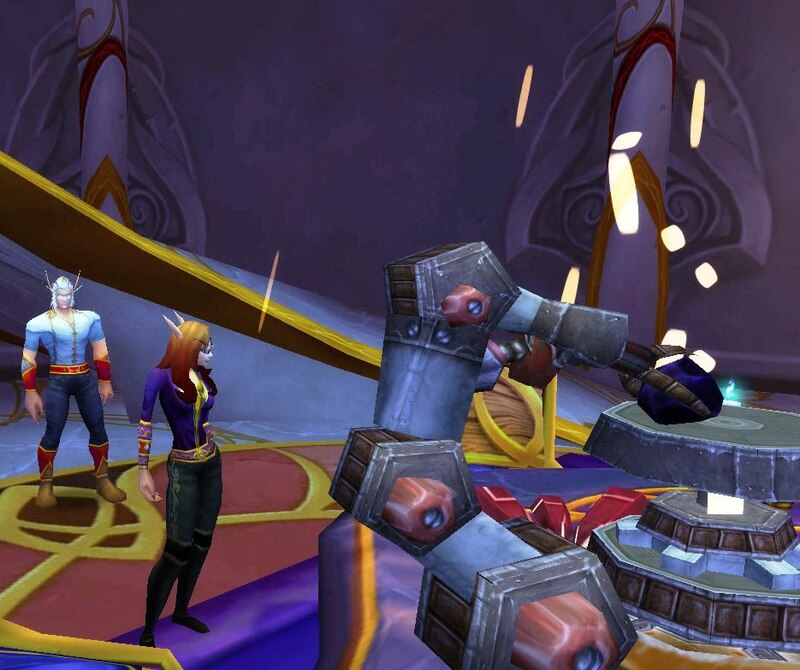 The Orange Mageweave Shirt ties in with the orange in the Watcher’s Cap. 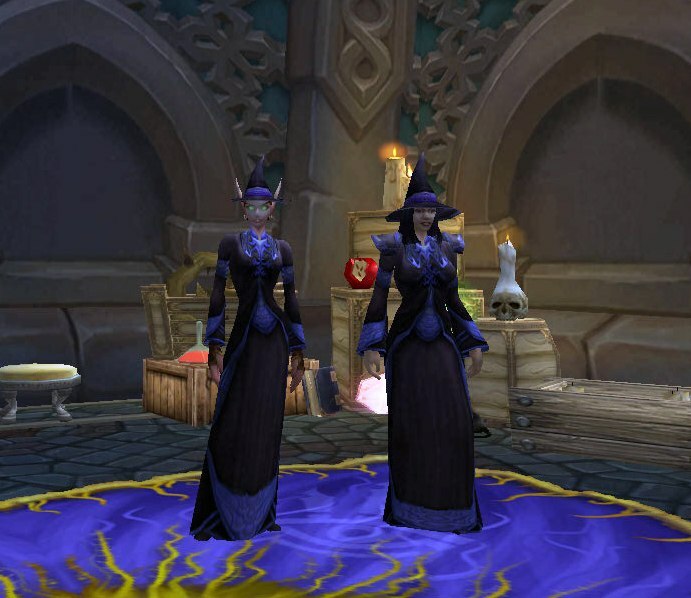 This same robe style and helm combo can be done in other colors: Red Linen Robe/Blue Linen Robe with the Red Pointy Hat/Sorcerer Hat , or the Dalaran Nurse’s Gown with the Violet Hat. 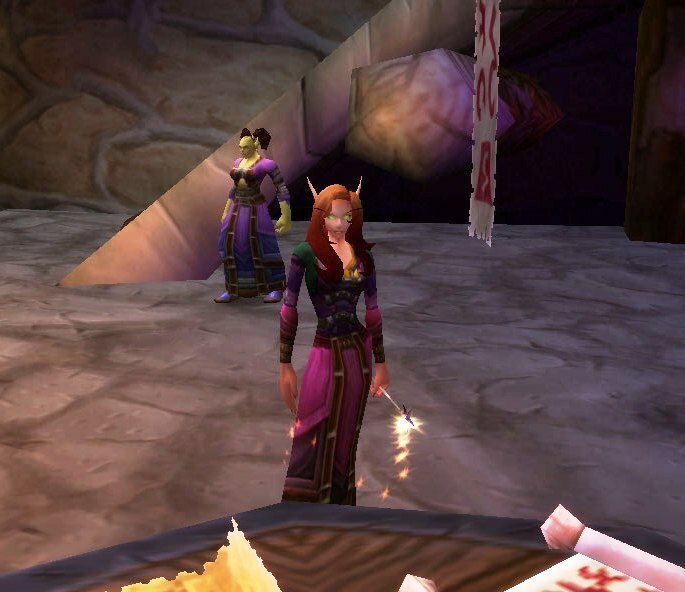 This outfit kind of looks like the Orc enchanting NPCs in the picture (well, Kithas is the only one pictured). I mixed it up in this outfit with the Highborne Padded Armor, but, the Resplendent Tunic can always be used for a more blended look instead. I say that there are many different ways to obtain this outfit because this style of chest-piece/sarong comes in several different colors: another set being the Celestial Tunic and the Celestial Kilt. There are full robes that give the same look, as well, and saves you from having to find 2 separate items: the Resplendent Robes, Celestial Silk Robes, Bonecaster’s Shroud, or even the Vestments of the Atal’ai Prophet. I switched up the color scheme of Tabetha’s outfit – I feel the purple colors match better for enchanters. 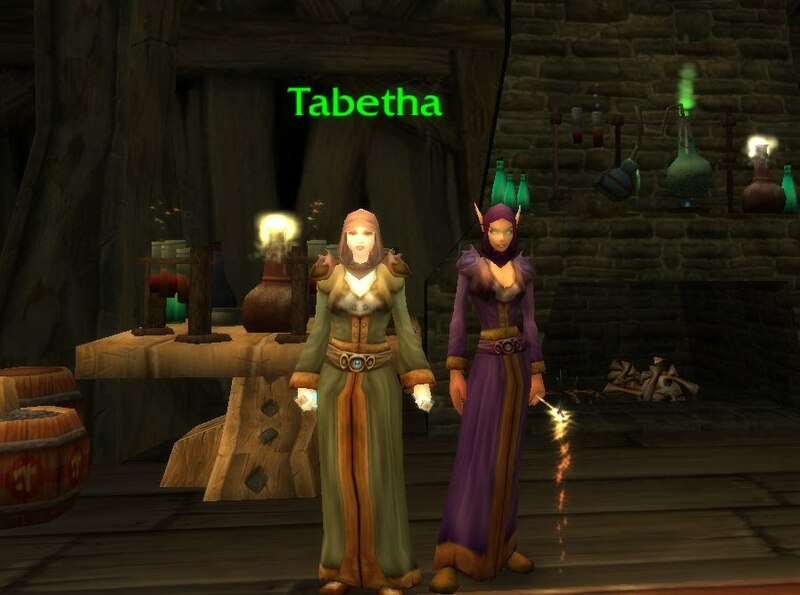 Tabetha’s outfit can actually be made with: the Enchanter’s Cowl, the Neophyte’s Robe, the Chestnut Mantle (Horde quest reward, but, a close match could be the Ritual Amice), and the Jewel-encrusted Sash. You could always add the Lavender Mageweave Shirt underneath the tunic to bring out more of the purple accents in this outfit. The Skywitch Hat has many alternates to consider, and the Haliscan Pantaloons can easily be replaced for the Tuxedo Pants (but I like the extra fancy scroll work on the pantaloons for an added touch to the outfit). 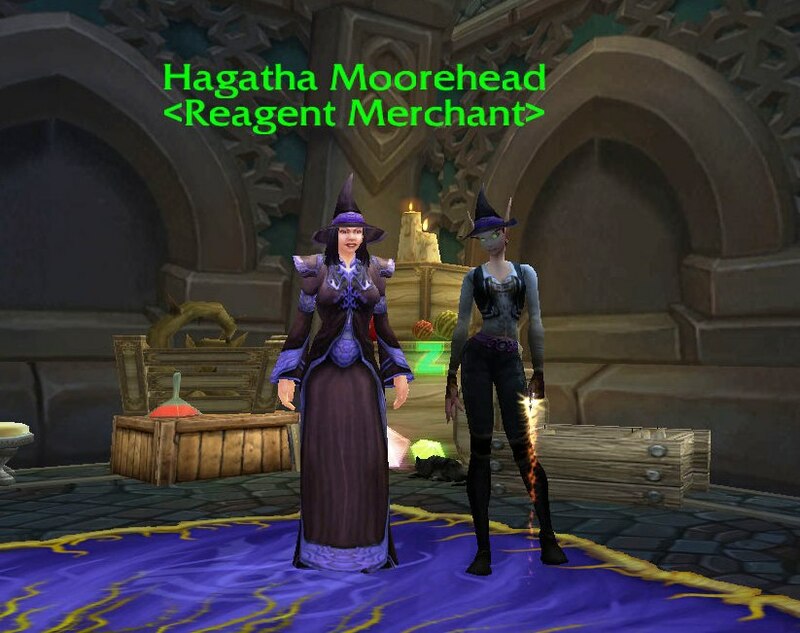 This is more of the “girl” equivalent (and a good match to what Hagatha Moorehead is wearing)…although it is strikingly similar to Kirina’s witch Hallow’s End costume >.< I guess I should have added some shoulder armor like the Opulent Mantle for the outfit to be a little bit different. Most enchanter NPCs tend to be wearing robes, and, I feel that they are best suited for these types of outfits. Enchanters also have more brightly colored armor, and the outfits should be accented with glowing off-hand frills and or pole-arms/staves (they can even be enchanted ^_^). 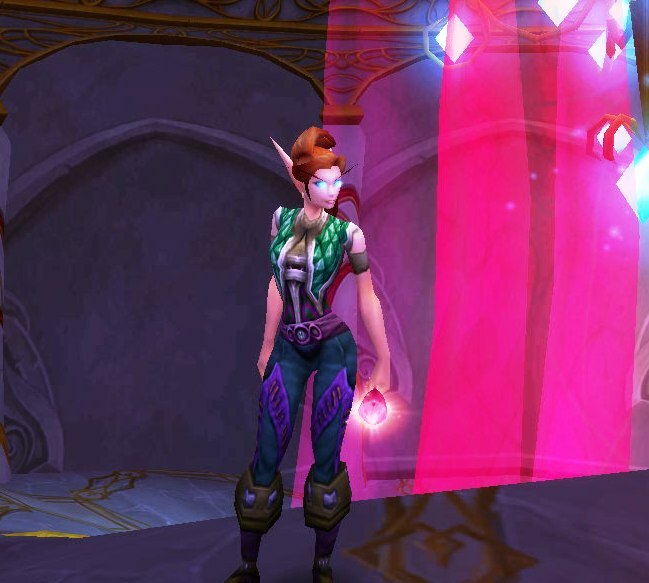 Jewel-crafting outfits are some what easier to put together in this realm of professional wear; however, some of those more unique items to make these outfits special can be hard to come by for some players. Chest-pieces like the Aurora Armor are useful in many outfits, and can be found on NPCs such as Amin (pictured above – he’s wearing it with custom bracers and the Unadorned Chain Belt/Boots ). Paired with common items, like the Knitted ones, plays down the fancy gold detailing on the chest-piece; however, the Aurora Armor can also be dressed up very easily. 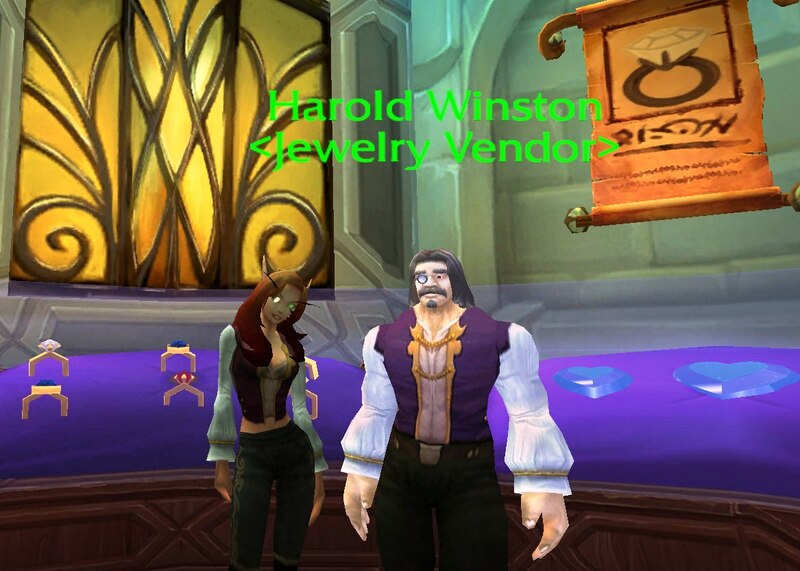 Harold Winston actually wears the Tuxedo Pants, but, I felt that the Haliscan Pantaloons added a bit more flare to the ensemble. The Noble’s Monocle is a must have for jewel-crafting outfits – your character will need it to see the fine detail in all the jewels and stones s/he works with. If you can not get a hold of the Noble’s Monocle, there are a couple of other clear lens options, such as the Eye of Flame or the Chief Architect’s Monocle…thought these options may be just as hard to come by as the Noble’s Monocle. The style and the color of the Starfire Vest can be found in many other chest-pieces, such as the Runecloth Tunic. Glow effect on hand caused by the Noble’s Elementium Ring. If you have the gold to spend on the Noble’s Elementium Ring for you character, it is, by all means, worth it (sadly, I do not have that kind of gold to spend on Kirina right now). The effect of the ring is very pertinent for a flashy jeweler’s outfit. 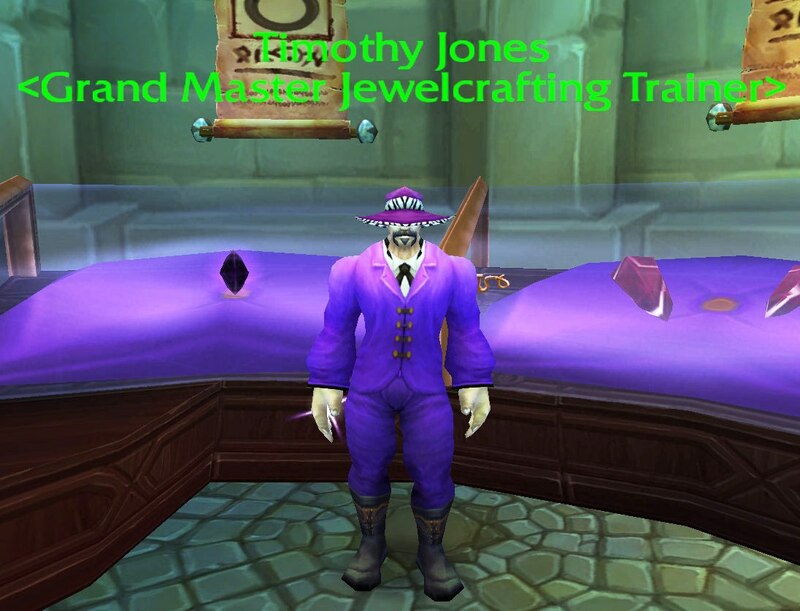 If purple is not your color, you can get this same look with: the Stylin’ Crimson Hat/Red Dinner Suit, Arcane Cover/Blue Dinner Suit, or just the tuxedo suit with the Stylin’ Jungle Hat. This is another common looking jewel-crafting outfit. The White Swashbuckler’s Shirt may seem to be a bit much layered underneath the tunic, but, I was going for a look like the one found on Tiffany Cartier…Kirina’s sleeves do not flare out like the NPC’s. And, while there are other belts in the same style and color of the Jewel-encrusted Sash, I particularly like this item for these types of outfits due only to its name – “jewel encrusted” definitely relates to a jewelers style. 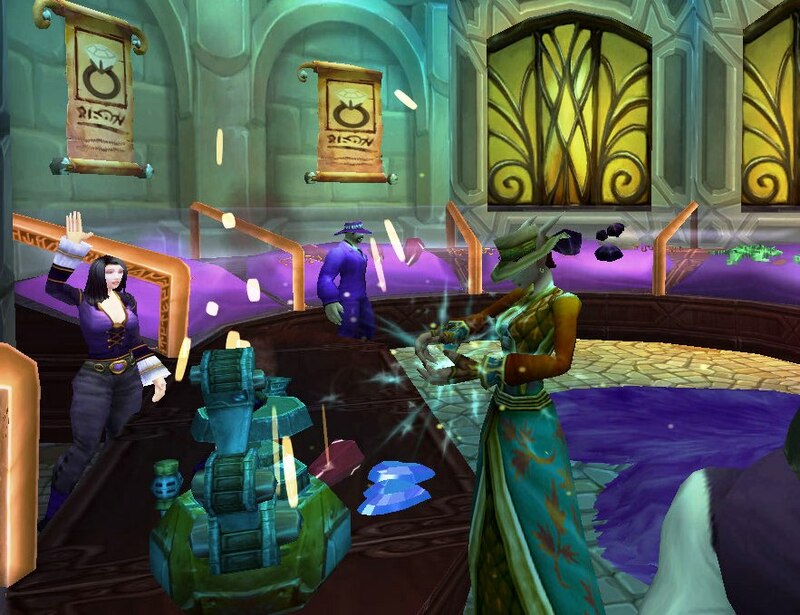 The gem shaped Demoniac Soul Prison was a Horde quest reward, but the same style of off-hand can be found in those such as the Jewel of Infinite Possibilities or the Netherwing Sorceror’s Charm; however, any shiny gem-like off-hand will do for a substitute. The Ruby Shades, and other helms like it, can be also included in a jewel-crafter’s outfit to protect the eyes from flying sparks from grind gems and stones into beautiful shapes (as seen in the picture). The Magister’s Bindings and the Magister’s Belt compliment this type of outfit wonderfully with the rich embroidery and the jewel-like accents on them. 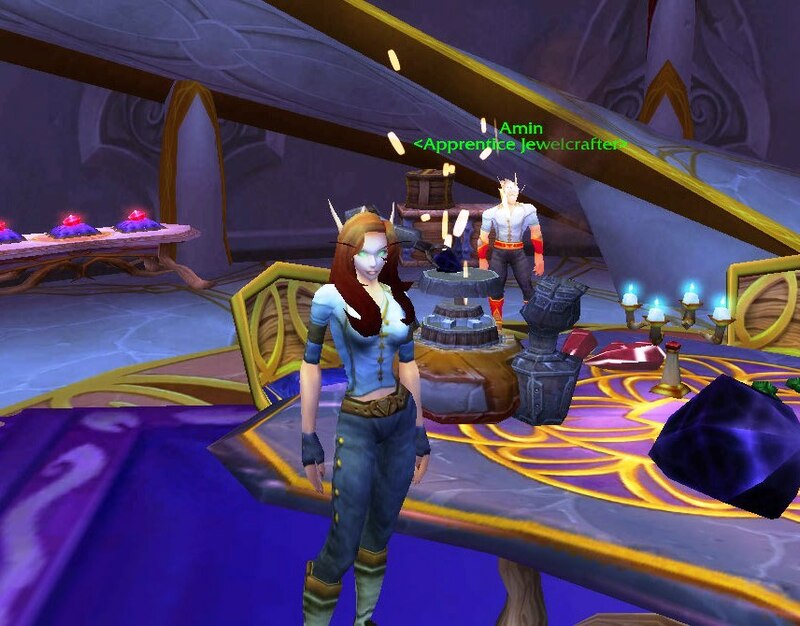 If you can not get a hold of either for your character, do not worry, there are plenty of fancy belts and bracers to choose from; browsing the auction house, and seeing the different items available on your character while doing, so is a great place to start looking. Like I stated in The Crafter article, this chest piece combines several different types of fabrics that’s great for tailors, as well as jewelers; the shiny diamond fabric is perfect for flashy jewel-crafters. I did not include bracers to allow the sleeves to be more flouncy, while the hat fancies up the entire outfit. Again, the diamond fabric goes well with jewel-crafting outfits. If amber is not your color, there are other robe alternatives in the same style, which include the Embrace of the Wind Serpent (green), or the Robe of Volatile Power (violet-red). 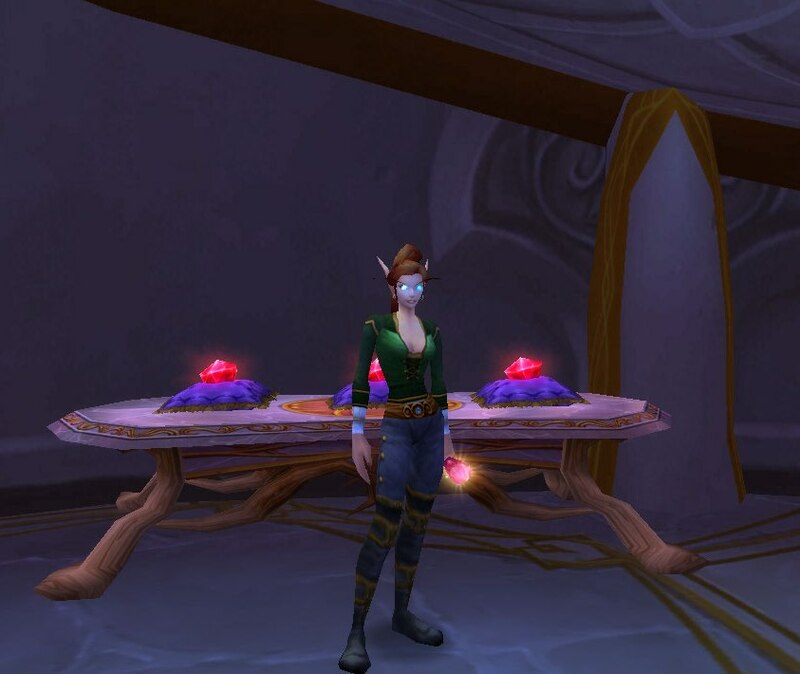 In my opinion, jewel-crafting outfits are at there best when they include flashy accessories, such as the Noble’s Monocle, and the Noble’s Elementium Ring, or a gem/glowing stone off-hand; including jeweled clothing items will also accentuate jewel-crafting outfits. You don’t have to stay within the cloth/leather armor range – mail and plate armor offers beautiful pieces that appear to be pure gold, sparkly, or jeweled. But, what you want from your outfit is really up to you. And finally, the Inscription outfits. You have a choice on what you would like your character to wear – a more wizardly inscription outfit, or a more “scribe” inscription outfit. 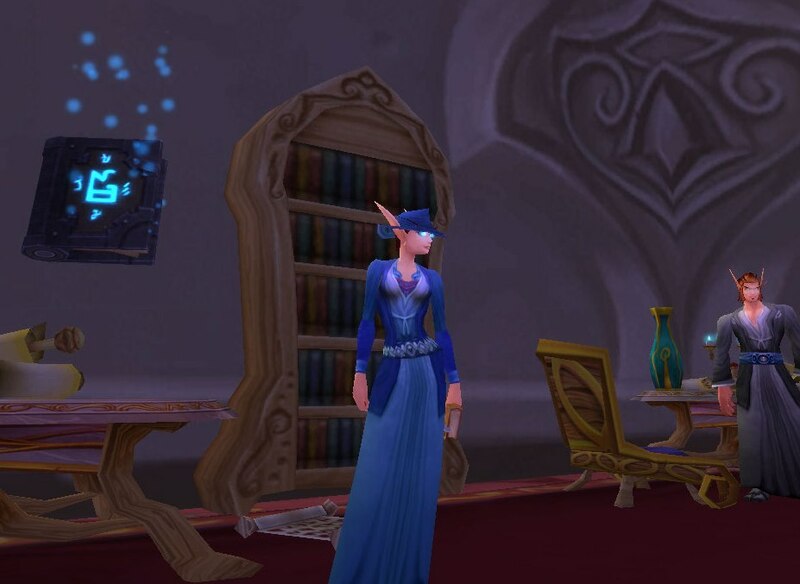 However, most of the outfits shown in this section are robes…which is what tends to be what most of the inscription professionals in-game wear (both male and female). 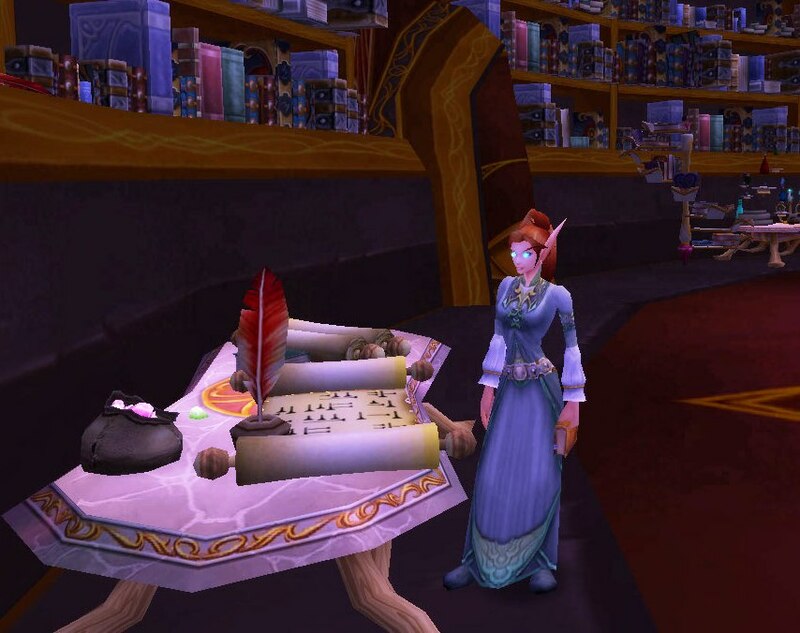 The off-hands and other accessories are also limited for this section; a great off-hand would be an actual feather quill, or scroll,…but…Blizzard has not thought of that yet ^_^. This is a pretty classic outfit. Book off-hands are a great choice (for obvious reasons) to include in this type of outfits, and there are so many to choose from. 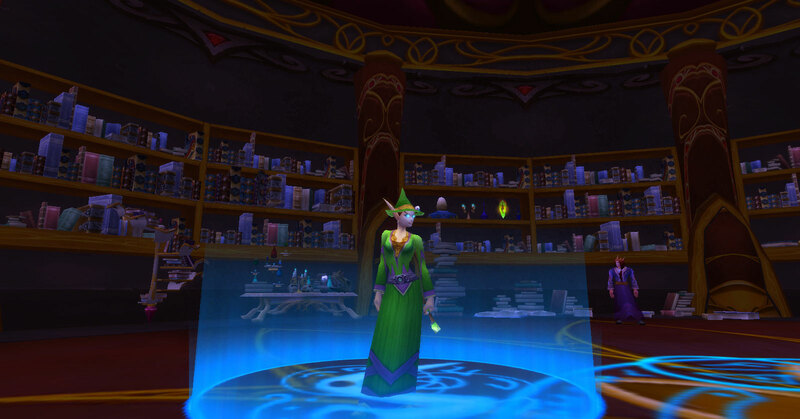 This outfit can be achieved in many different ways – there are plenty of low-level green robes with the same design as the Shimmering Robe in many different color schemes (such as the Royal Gown, or Necrology Robes); there are a few more pointy wizard-like hats to chose from, as well. 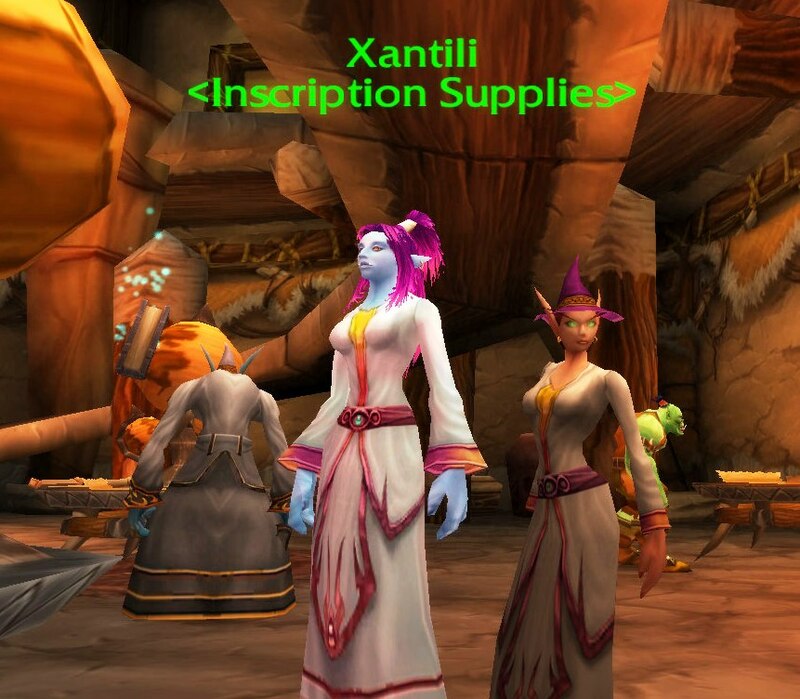 Looking like the inscription supply NPC, Xantili, is another great alternative to the previous outfit. 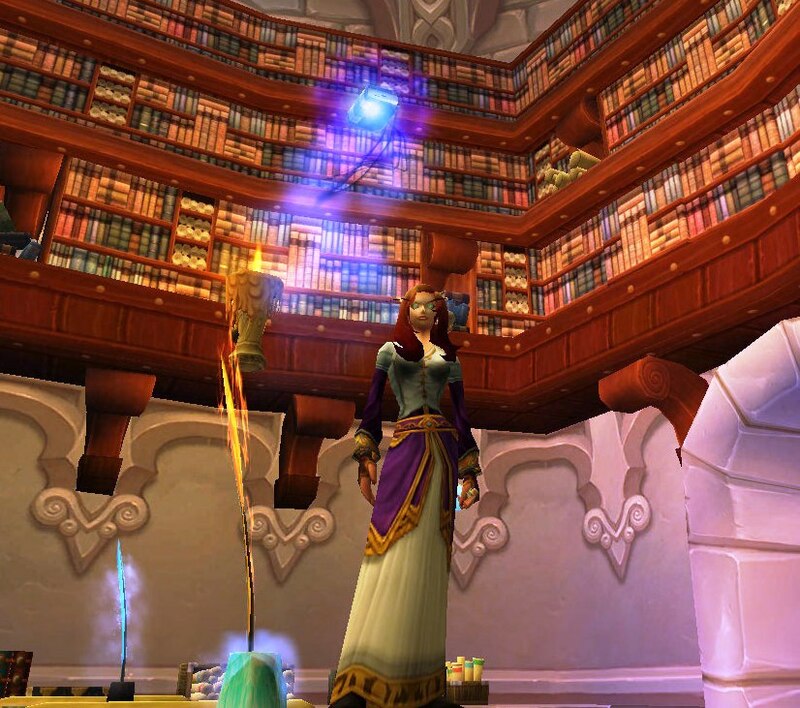 But, if pointy hats are not your thing, a helm like the Arcane Cover will work just fine, too. This outfit is also a good example of how well mail/plate armor items can mesh into “mystic” outfits -the blue in the Defender Girdle goes perfect with the robe. 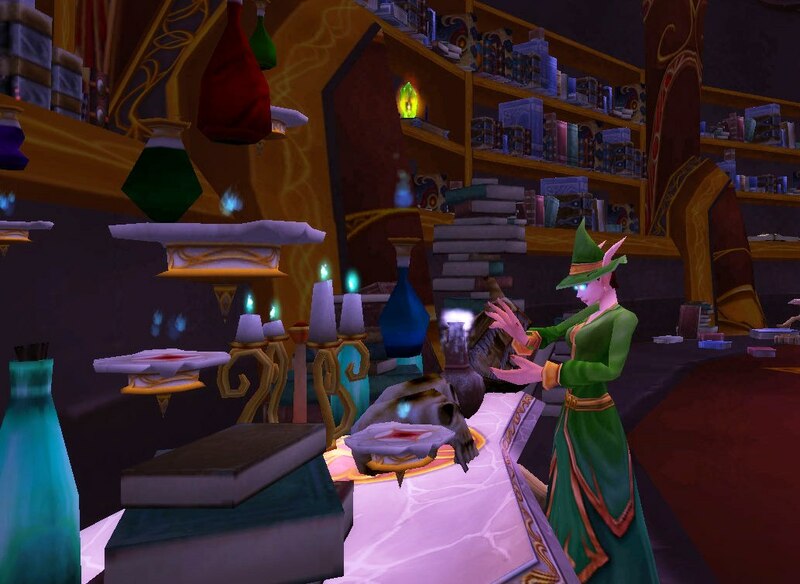 There are many hats in the same style as the Arcane Cover – another solid colored one is the Master’s Hat (black). Another helm style for inscription outfits could be like the Vindicator Cap. I really wish there were off-hands that looked like those epic-looking quills in the picture. Instead, I used a flask off-hand, the Tears of Heaven. While this is more pertinent to alchemy outfits, it can pose as a bottle of ink for an inscription outfit….right?….anyone? Anyway…If you can not get a hold of the beautifully versatile Soothsayer’s Kilt (quest reward for both factions), the Simple Kilt will work just fine, too. The “dirty” cuff sleeves on the tunic really brings out the inscription side to this outfit – it looks like the sleeves have been continuously brushed up against ink. The Noble’s Monocle, or another helm like it, will also add to this outfit; the monocle is needed for intense, close-up writing. Goggles with clear lenses, could also work. Hopefully, this article gave you some ideas on how to put together a “mystic” outfit (or outfits ^_^). I only used the clothing items I already had on, or were saving for, Kirina and Merlaina, so, I am sure that there are plenty of other combinations to be had with the tons of other gear in-game; it’s all about what you like for your character.